Barry County farmer Nicole Campeau, and her daughter, Rayann, left, sell asparagus at the weekly Hastings farmers market. On a Wednesday afternoon on main street Hastings, Ron Barch found just what he was looking for. At the weekly farmers market two days ago, he got himself a pound of just-picked asparagus from a farm two miles away, from growers he knows by name. “Hastings is a wonderful town,” said Barch, 71, a retired teacher who grew up in Detroit. It’s a typical sentiment heard around here. 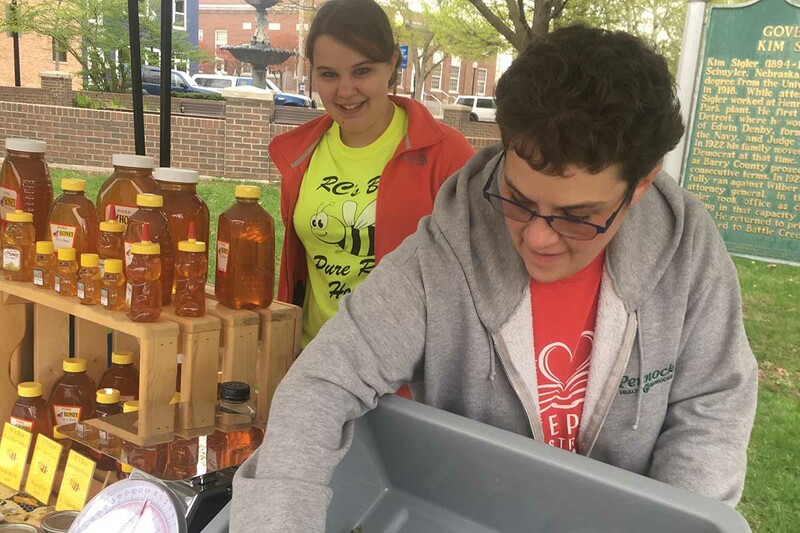 But still, this community of 7,300 people 30 miles southeast of Grand Rapids, and the surrounding rural area that is Barry County, wrestle with their share of challenges. A week apart in April, the Hastings Banner duly noted the sentencing of two area residents for methamphetamine, one for possession sent to jail, the other to prison for dealing meth. A couple months earlier, a 40-year-old man was sentenced for manufacturing meth. Meth has been an underground fact of life in this county and much of southwest Michigan for years. Adding to the problems lately are opioid overdoses, as Barry County recorded six opioid deaths in 2015, two more than in 2014. 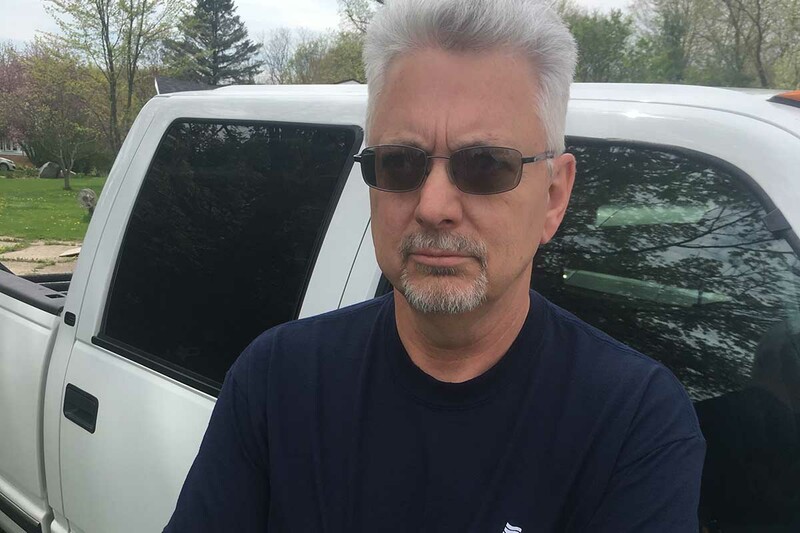 “Drugs is a big issue, just like it is everywhere in Michigan,” said Fred Jacobs, a lifetime county resident and owner of the Hastings Banner and nine other newspapers in Barry and Calhoun counties. Bridge Magazine visited Hastings on Wednesday as part of Bridge and The Center for Michigan’s 2018 Truth Tour, which aims to engage and inform Michigan residents on the biggest challenges facing Michigan voters ahead of this November’s statewide elections. But Hastings City Manager Jeff Mansfield said drug issues haven’t much changed the character of the town. “We have the same problems that every community has. Alcohol and drugs are here. But it doesn’t lead to a lot of crime. He pointed to recent downtown improvements, aided by private donations. About five years ago, Hastings opened Spray Plaza, a combination kids play area and concert venue. Private donations paid most of its $400,000 cost. Two years ago, it opened Thornapple Plaza, a $1.1 million 700-seat concert venue along the Thornapple River. A local family foundation funded it. The city hosts free downtown concerts throughout the spring and summer. And the area has hung on to major manufacturers like water heater manufacturer Bradford White Corp., in Middleville, which employs 900, and silicone hose maker Flexfab, in Hastings, which employs 400. 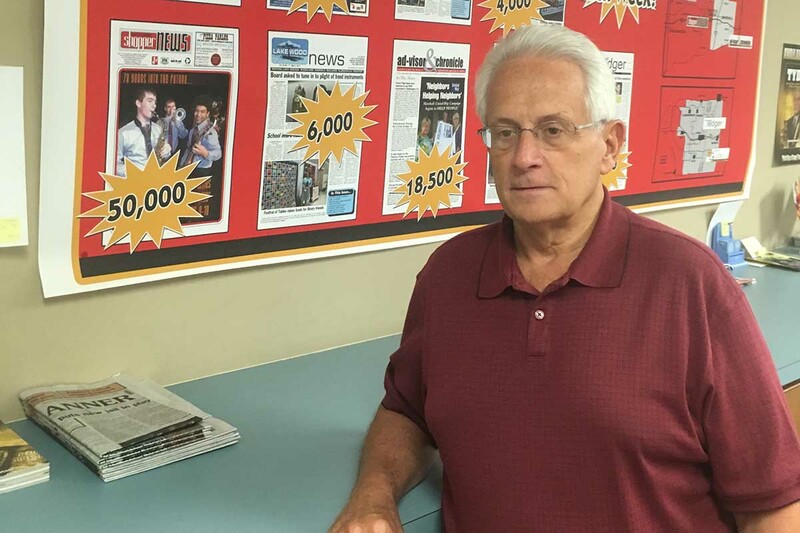 “A lot of people hold the same job for 30 years,” said newspaper owner Jacobs. Stan Wilkins, 63, has worked 44 years for Bradford White, earlier in the paint department, now as an inspector. Wilkins said he was laid off for a few months shortly after he was hired. “I haven’t been laid off since,” he said. And by many gauges, the area’s pretty well off. According to the U.S. Census, Barry County has a median income of $56,883 compared to the state median income of $50,803. Its poverty rate of 9.3 percent is lower than the state’s poverty rate of 16.3 percent. 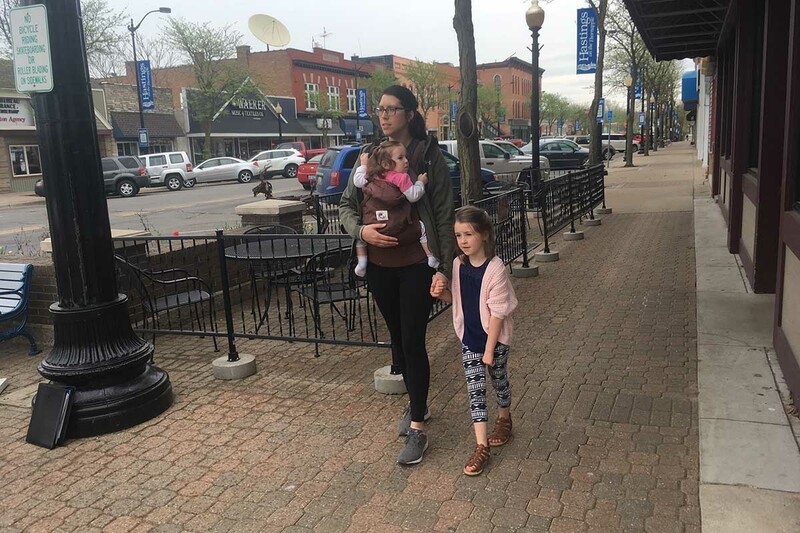 In some ways, it’s a bedroom community for surrounding cities like Grand Rapids, Kalamazoo, Battle Creek and Lansing, while a fourth of its workers commute to Kent County for jobs. But area schools, like many around the state, struggle with declining enrollment. Hastings Area Schools lost 262 students from 2014 to 2017, and neighboring Delton-Kellogg Schools lost 224 in the same period. Hastings students in grades three through eight tested 45 percent proficient in reading – not exceptional – but better than the 38 percent statewide proficient in reading. Overall, the county could do better in educational attainment. Just 19 percent of those over age 25 have college degrees compared to 27 percent for the state. Twenty-seven percent of county high school graduates are career or college ready, compared to 35 percent statewide. Until the 1990s, this community was known to many outsiders as the maker of Hastings oil filters. Nowadays its claim to fame might be the annual spring Barry-Roubaix, which bills itself as the world’s largest gravel road bike race. It’s the lone entry under “Arts and culture” on the city’s Wikipedia page. The race, which took place in April this year, attracts thousands of riders from dozens of states and overseas. An economic impact report calculated that participants and friends and family spent more than $500,00 on food, beverages and lodging for the 2016 event. 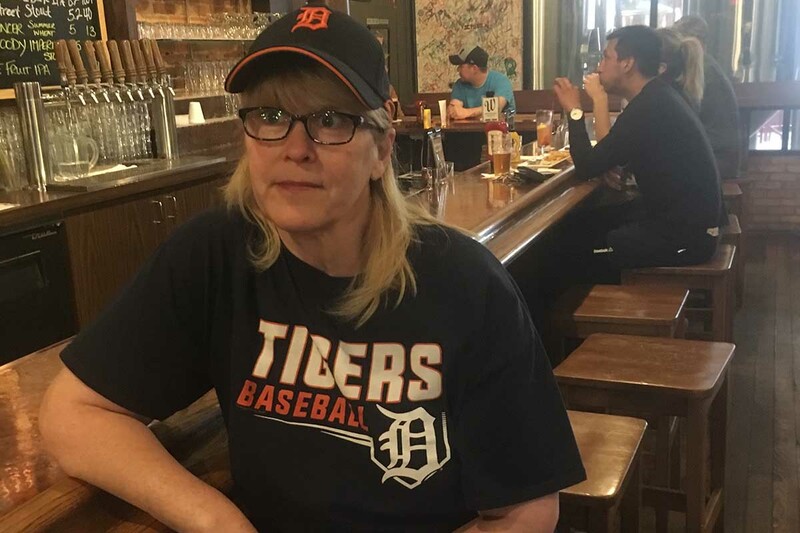 Brenda Brinks, manager of the Waldorff Brew Pub and Bistro in Hastings, said business starts to pick up a few days before the race as bikers arrive to practice the course and stop in for a beer and a bite to eat. Thanks for the article. Mr. Roelofs does a good job of asking where [Hastings], when [now], and what [employment to education]. What I wonder about is why and how because those seem to be the things that others could use to change themselves. Don't we all see something in the article we like to see a little more of in our community? Why does Mr. Roelofs leave these questions out of his reporting; is it a Bridge policy, is it because they don't care so they assume readers don't care, it is a lack of experience or training, is it harder to do? If Hastings has been able to keep higher employment, if its kids are doing better than most of the state, if nature of crime is less violent, if the businesses are stable and investing in themselves, if the streets and facilities are well maintained, wouldn't knowing why they are able to do this and how they are doing it be a benefit for many of the communities in Michigan and many of us who live here?